The B-APCO Control Room Arena. Victims of crime will receive better and quicker help from police after Microsoft and its partners unveiled the ‘control room of the future’ at the recent B-APCO Exhibition. The technology, which has been developed by Microsoft Services, mapping service Esri and communications firm Frequentis, could be used to help control room staff quickly identify if victims of domestic violence require immediate help or where the closest police cars are in relation to a serious traffic accident. The control room is more efficient, cuts response times and can spot patterns in incidents. Peter Prater, Key Account Manager at Frequentis and B-APCO Executive Committee Member, said, “The information available to the emergency services to influence incident response will grow more rapidly in the next five to 10 years than it probably has in the past 40 to 50 years. 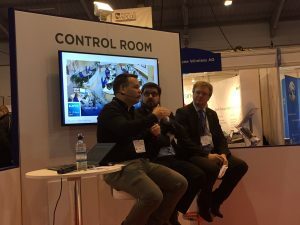 It is imperative that emergency services organisations can constantly evolve their control room solutions and workflow to accommodate this fact. With policing budgets under pressure, chiefs and commissioners met in November to map out how law enforcement can provide better value for money for the taxpayer over the next 10 years. Part of that plan was to make ‘far better use of digital technology’.